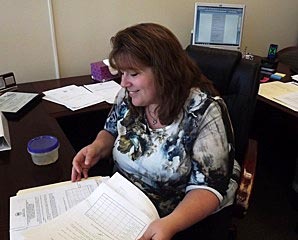 Coaster Photo – Cindy Dye, Asbury Park’s new city clerk, started her job this week. Asbury Park’s new city clerk took over her job this week and said she feels up to the challenge. Cindy A. Dye, who left her job as clerk for North Hanover, began her new job on May 1 and said she is “glad and excited” to be in the city. The city clerk position was temporarily held by Deputy Clerk and Registrar Melody Hartsgrove, who will now go back to her original jobs. Hartsgrove replaced City Clerk Stephen M. Kay who retired in February after serving 34 years in the position. “Asbury Park looked to be challenging. North Hanover is a small farm town and little slow-paced for me. And I was looking for a challenge,” Dye said. She said she was enjoying her first days on the job. “I enjoy the people and things are very busy. The city is seeing a lot of renovations and I am trying to move this along and glad to be a part of it,” she said. Dye lives in East Windsor Township, where she was also municipal clerk, with her husband and two children. Mayor John Moor said that the governing body narrowed the 15 to 20 applicants for the clerk’s job down to the top three or five. “I feel she was the most qualified and will be great addition to the staff. She has already done this job for many years and has the experience,” he said. Dye has been a municipal clerk since 2003. She was hired for a three-year term at a $75,000 annual salary.